UN peacekeepers play a crucial role in countering threats to peace and security worldwide, often dealing with very complex situations. This book provides a complete overview of the international laws and guidelines governing the development, management, and conduct of these opera... read full description below. United Nations peacekeepers currently play a crucial role in international responses to threats to peace and security across the globe. Since 1948 the UN has been involved in over 60 peacekeeping operations. However in the current environment of complex and rapidly changing threats to peace, there has been a dramatic increase in the use of UN peacekeepers to deal with situations of instability. In 2009 alone over 100,000 individuals are deployed on such missions. This situation has resulted in a range of new and pressing challenges to the legal framework applicable during such collective international action. This book provides, for the first time, a comprehensive account of the legal framework regulating this area of collective international action. The book contains key documents in the areas of privileges and immunities, human rights law, international humanitarian law, and international criminal law. Types of documents featured include foundational treaties, international rules and regulations, memoranda, judgments of the International Court of Justice, and some mission specific documents. 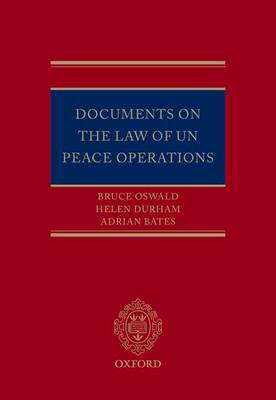 Before each document a prefatory note is included, outlining the historical development of the document as well as its relevance to UN peace operations. To further assist scholars and practitioners in their work, the work concludes with a guide on undertaking further legal research on the laws relevant to peace operations, a list of all UN peace operations and relevant enabling resolutions, and a suggested approach to interpreting Security Council mandates. From scholars and students to policy makers, representatives in the military, police and humanitarian organisations - this book will be an invaluable resource in the development of a better understanding of the legal framework surrounding the establishment, management, and conduct of peace operations that are mandated and controlled by the UN. Bruce Oswald is a Senior Lecture at the Melbourne Law School. Mr Oswald has served in the Regular Australian Army as a legal officer and has seen operational service in countries including Rwanda, Timor Leste and Iraq. Dr Helen Durham is a Senior Research Fellow at the Melbourne Law School and has worked for international humanitarian organisations in the area of legal adviser on international humanitarian law. Helen has been involved in international treaty negotiations and also been a part of operational missions in South East Asia. Adrian Bates is a Research Fellow at the Melbourne Law School where he completed his law degree in 2007. Prior to this Mr Bates worked as a Senior Project Manager at the State Library of Victoria.